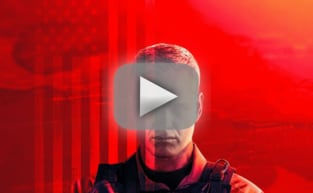 The Last Ship Season 3: Extended Trailer and A Heroic Return!! The stars of TNT's The Last Ship made a stop at San Diego Comic Con this Thursday. They brought with them some conversation and news about what's ahead. Eric Dane (Capt. Tom Chandler), Bridget Regan (Sasha Cooper) and Adam Baldwin (Capt. Mike Slattery) were on stage along wth executive producer Steven Kane. Not only did they show an exclusive clip to convention goers and the incredible trailer that follows, they talked in some depth about making the series and what it means to them. For example, it's important to get it right. Regan is playing a new character this season, and she had her work cut our for her. “One of my favorite things about the show is the amount of effort that everyone puts into getting the Navy right and doing it justice,” she told the crowd. “Every cast member puts so much effort into knowing and trying to fill these characters as realistically as they can, so I had a lot of catching up to do." Their world was also expanded this season, something very important to the series. “The first season literally was these people on the ship," Kane said. They're essentially rebuilding a new democracy from the ground up, and that's something Kane wanted to do some justice. “We’ve seen this historically after great plagues and through the Middle Ages,” said Kane. “We wanted to put that kind of minefield into the story and throughout the whole season build this political story for this president who comes in." "He was not elected — he was No. 12 in succession. And yet he’s doing his damnedest to get things right." "The country is trying to figure out how to accept this. Someone says later on in the season, ‘They were glad that you brought home the cure and saved the world, but now they want Wi-Fi.’"
We sure appreciate all that they do to make things as authentic (and exciting) as possible on The Last Ship. Speaking of authentic, when the trailer you're about to watch was revealed, the crowd went wild at the Tex sighting. He'll definitely be returning and as heroic as ever. When there's a mole in the White House and the best is needed to infiltrate, who do you call? Tex! Buckle down for the rest of the wild ride, and if you need to catch up, watch The Last Ship online right here at TV Fanatic. What do we tell the crew? Chandler. Everything. We tell them everything. Permalink: What do we tell the crew? Chandler. Everything. We tell them everything. Are you telling me the whole world is dying and they sent two people to save it? Permalink: Are you telling me the whole world is dying and they sent two people to save it?